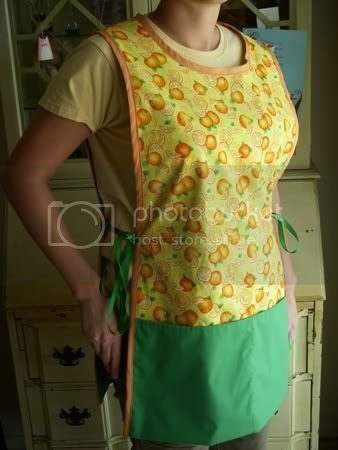 I made this apron as a gift for a friend's bridal shower. 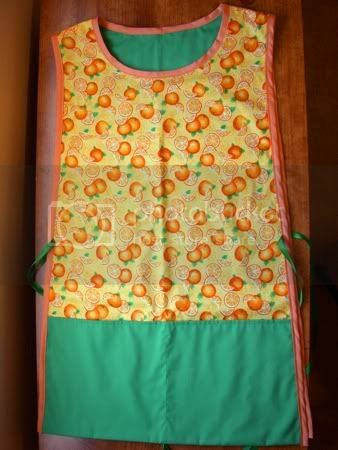 I made a similar one for myself a long time ago (I think it was my first sewing project ever) and really love the style - it covers everything! The pattern is Simplicity 5525 which is unfortunately out of print but Simplicity 4987 and McCall 5690 are similar. The only modification I made was to leave out the elastic waistband - I don't like the way it looks and it works just fine without it. I never thought I would be a homemaker, but for the moment I have to admit to being one. At least it sounds better than "unemployed"! I enjoy writing and doing crafty projects, though I can't seem to stand doing the same thing for too long. Consequently I'm doing something new every week. And of course I adore cats, especially my darling terrors Lucy and Sophie. Notice: My patterns are free and may not be sold. Please do not reproduce or repost patterns or instructions from CraftyCattery.com without my permission. For information on selling items created from my patterns, please view the FAQ.